When it comes to ordering logo wear and deciding which is the best website to order custom tshirts for you, you will want to keep a few things in mind. Things like convenience, price, turn around time, and quality for starters. Some sites are strictly web based and getting ahold of someone human is impossible. Some sites are like a three ring circus when it comes to figuring out how to design shirts online. Other companies out source their printing so you are paying a lot more than you need to. Quality is a big sticking point and a lot of online companies are more volume based and returns are part of doing business. Figure out what site works best for you and your needs and you’ll be a customer for life. When looking for the best website to order custom tshirts you’ll want to look at convenience. Take a look and see if you only order online or if they allow orders by phone. Is it easy to contact a live person when you call the number. Can you easily move around their site and get answers to questions you might have. If you can design your t-shirts online is their design lab easy to use and figure out. The bottom line is you want to make ordering custom t-shirts as easy as possible for yourself. At Talkingink Custom T-shirt we work hard to give our customers convenience. We provide several ways to place an order with us either by phone, email, or online with our shirt designer. Should you have a question we are always a phone call or email away. Nobody gets paid to be a custom t-shirt orderer so we understand you have other things going on in your life. We try to keep it simple and convenient. Price pays a big part in the best website to order custom tshirts. The larger websites are order takers who actually send your order someone else to be screen printed. That screen printer then drop ships the shirts to you so the company you actually ordered your shirts from, never actually sees your shirts. Every hand in that order needs their piece of the pie so you end up paying more for your custom t-shirts than you need you. Look for a company that strictly prints their shirts in-house. They have a better turn around time, pricing, and quality control. Talkingink screen prints all customer shirts in-house under one roof. Our history and volume enable us to receive better pricing from our distributors on the shirts. The shirts go from the distributor to Talkingink, to you. Let hands equals a better price. Plus since we print in-house we have better quality control and well as control over turn around time enabling us to meet or exceed every customers needs. 100 T-shirts with a 3 color design is $7.57/shirt with a 1 week turn around at Talkingink. The larger companies are charing $10.00+ for the same shirt, same design, and 1 week turn around. Sometimes turn around time isn’t a big deal while other times customers have a certain date they need their shirts. Finding a couple with a history of meeting deadlines is paramount. Companies that print in-house will have far more control over turn around time than companies who sub the printing out. Getting shirts last minute can be stressful as well. Find out what a company needs to consider an order “placed” and ask what their standard turn around time is. Often times people think that the turn around time is based on the day of their first phone call. However things like artwork and sizes and shirt color and style need to be decided before an order can proceed. So an order isn’t considered placed until all of these aspects of an order are decided. 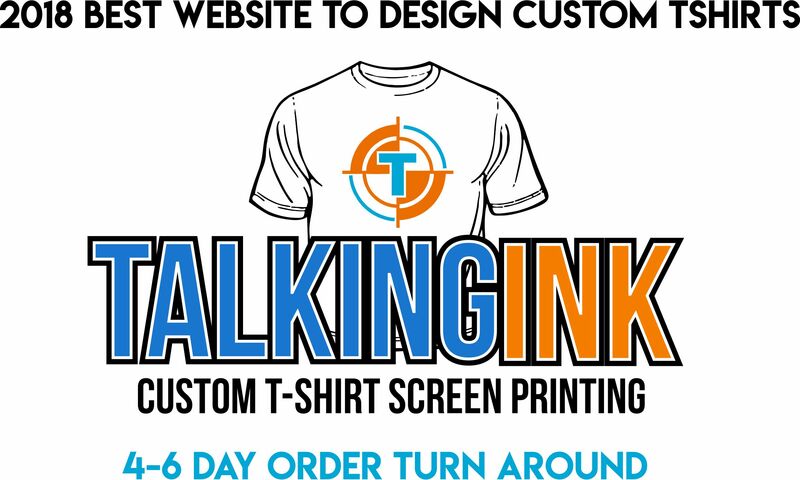 Talkingink Custom T-shirts has a standard turn around time of 4-6 business days. If a customer has a looser deadline we still turn the order around sooner than later for them. Printing in-house allows us complete control on print schedule and we prioritize based on customer need. Therefore when all possible we don’t charge rush order fees. In order for a print order to move forward we need to have all information and the artwork needs to be decided on as well as shirt style, color, and quantity. When those factors are known then we consider an order to be placed. From that date shirts will be ready in 4-6 business days. Unless a customers design starts cracking or washing away after just a few washings, customers won’t know if they are getting a high quality product or not, in most cases. Generally the screen print should outlast the life of the shirts itself with minimum breakdown. White ink will crack over time and the ink will fade. But if you wear a t-shirt twice a month it should last you quite a few years. Things to look for in regards to print quality aren’t easy. But there are a few things you can look for. If you have white ink in your design look to make sure shirt fibers aren’t screaming through the ink. Shirt fibers shouldn’t be noticeable on a good white ink print job. Also with white ink you’ll want to make sure there isn’t any post bleeding. Meaning if you order a red shirt with white ink, the white ink isn’t actually pink. If it looks pink then the shirt wasn’t cured correctly. Keep in mind if you are supplying artwork that the cleaner the artwork the cleaner the print will be. Shady artwork will result in a shady screen print. Screen printers can’t take a crayon drawing and print the Mona Lisa. If you are designing your shirts online with a companies designer, then that artwork will be top notch. As long as your ink colors aren’t bleeding and your design isn’t fading and breaking down after a few washings you should be in good shape. Here at Talkingink, our 20 years of screen printing and the trials and tribulations early on has made us a leader in the screen printing industry. We are experts are matching the correct inks to the correct garment type. We know when to print a silky smooth design or when someone’s design commands a more bulkier print. We have you covered because our printers love what they do and want to put the best product out there. On top of that we have great quality control people looking over each garment before it’s boxed. We invite you to check out some of our competitors and then see the value we bring to the custom t-shirt business. Companies like Customink, Zazzle, and designashirt. I think if you compare turn around, pricing, and over all quality you’ll see why Talkingink Custom T-shirts is the best website to order custom tshirts. You can start designing today here.